As a top Chinese Food Additive company, Sinofi is a professional and reliable Food Additives supplier and manufacturer serving global food, beverage, feed and pharmaceutical industries. 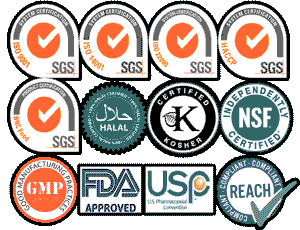 We specialize in manufacturing and supplying all kinds of food additives in terms of FDA, Food Chemicals Codex (FCC7), USP, BP, HACCP, Kosher, Halal, Iso, NSF and the customer’s or industry standards. As a professional and reliable Food Additives supplier, we struggle to provide “High quality, Reasonable prices and Professional service” to our clients and pride ourselves on being a Loyal Partner of your success. Email us about your needs, here you can find much competitive prices of high quality Food Ingredients, Food Processing Products and Pharmaceutical Ingredients. Currently Sinofi is seeking local distributors or agents worldwide to implement our global sales network. We sincerely welcome friends around the world to contact us for enquiries and hope to establish a long-term business relationship with you in future.